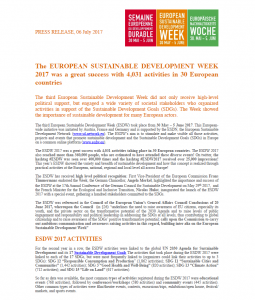 The third European Sustainable Development Week (ESDW) took place from 30 May – 5 June 2017. This European-wide initiative was initiated by Austria, France and Germany and is supported by the ESDN, the European Sustainable Development Network (www.sd-network.eu). The ESDW’s aim is to stimulate and make visible all those activities, projects and events that promote sustainable development and the Sustainable Development Goals (SDGs) in Europe on a common online platform (www.esdw.eu). 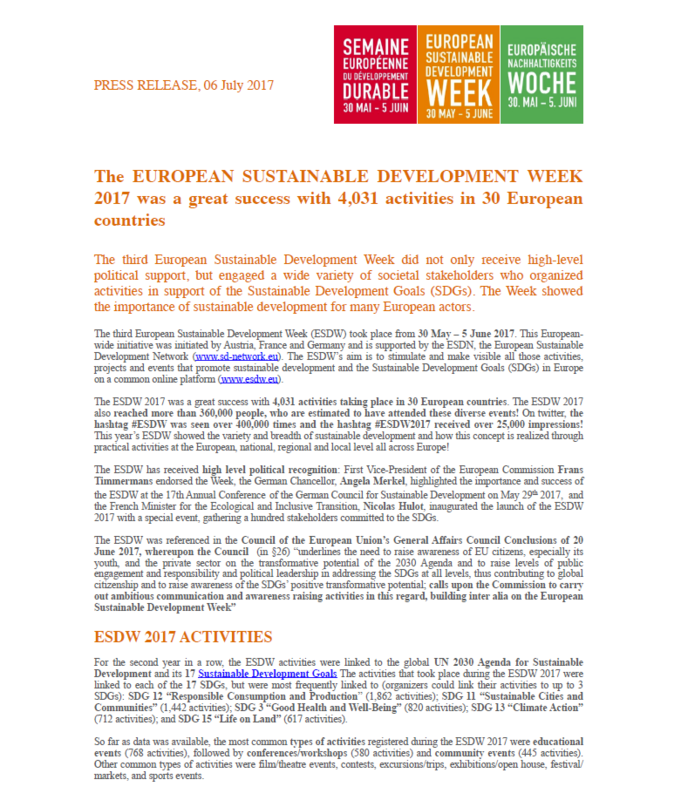 The ESDW 2017 also reached more than 360,000 people, who are estimated to have attended these diverse events! On twitter, the hashtag #ESDW was seen over 400,000 times and the hashtag #ESDW2017 received over 25,000 impressions! This year’s ESDW showed the variety and breadth of sustainable development and how this concept is realized through practical activities at the European, national, regional and local level all across Europe!